Peru is incredible and one that we fell in love with so easily! 🙂 An excuse to go back to Peru, maybe? How goes the travels? You are still one of my favorite blogs and I’m sad I am not able to keep up with every post. I’ve got one foot in the working world and one foot in the travel lifestyle. Trying to find balance. Miss you. I always find it amazing how talented these ancient civilizations were. They somehow had great mathematical abilities. Wonder if this angular town is a mirror image of anything in the sky? Just my curious mind. 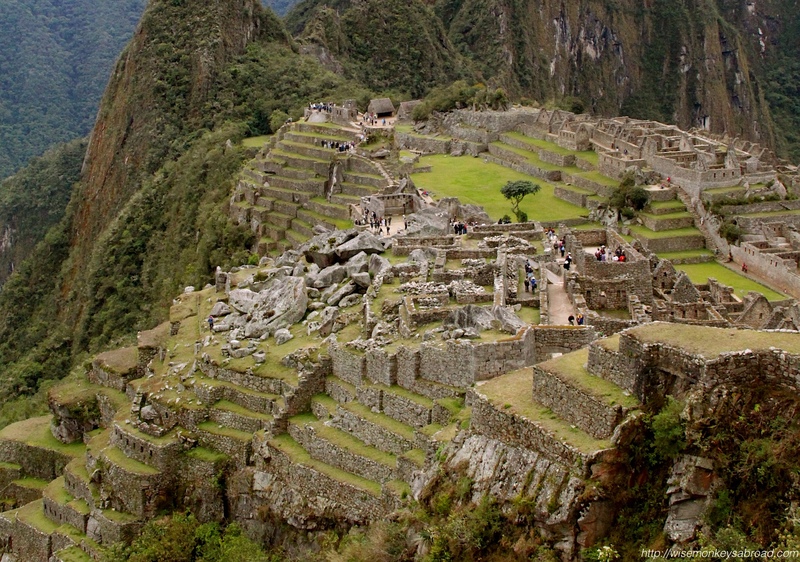 You picked a good one as Machu Picchu is full of angles. Thanks 🙂 We love this place!!! Thanks JANE – you are too kind 🙂 A comment that has made our evening – we get excited hearing that you look forward to our posts! Won’t be able to stop us smiling! The seed of the travel bug can be planted so easily so maybe that is when your wanderlust kicked in??? Thanks for sharing your memories and experiences with us! We are glad to have conjured fond memories for you! We LOVE ancient history a lot! I’d love to see it someday, but in the meantime I can enjoy it through your photo. Thanks Janet 🙂 We hope you get to it one day, it’s worth witnessing with your own eyes! Thanks Yvette 🙂 The precision and designs always astound us! Ahhh…. yes, it does make you wonder if there was outer space influence in building such structures 🙂 Hope you are enjoying the weekend! Brilliant shot for this week’s challenge. It also fascinates me that Macchu Pichu was built with hands and manual labour. The road up to this town looks so steep. Back in those days everyone must have strong legs. Yes!! The strength of the people to have used bare hands and backs to move and carry and lift. Not only are the sides steep, but the size of the rocks makes us feel so small and insignificant! Ahhhh, how wonderful! We have such fond memories of Peru. We absolutely love it there and a lot if it, is due to the incredible people 🙂 Can’t wait to see what you have to share of your time back home on your blog! Amazing history… we love it! Machu Picchu has been on my bucket list for way too long. Love the photo and perfect fit for this weeks challenge! We hope you do get to visit it one day! Isn’t it such a cool place to see with your own eyes??!! We were stuck on this challenge for a bit but then it dawned on us 🙂 Hope you have been well!